The Maldives celebrated Eid al-Adha on Tuesday with mass prayers, communal feasts and cultural festivities across the country. On populous islands, including the capital and the southern cities, the Eid prayer was performed in mass congregations in open-air spaces such as stadiums and parks. Large numbers of men and women, parents with young children and Muslim expatriates participated. The religious holiday marks the end of the Hajj pilgrimage. Ferries and flights were fully booked ahead of the Bodu Eid (Big Eid) nine-day holiday as thousands flocked out of Malé to fly overseas or spend the vacation in resorts and more idyllic inhabited islands. The merrymaking began after the early morning prayer and exchanging of greetings. Children and young people chased each other with packets of coloured water. A water gun battle with live DJ and cash prizes took place at the Maafanu stadium in Malé. In the capital and its suburbs Vilimalé and Hulhumalé, goats were sacrificed for the distribution of meat, an Islamic tradition to commemorate the Prophet Ibrahim’s sacrifice of a ram after God spared his son Ismail. Maldivians traditionally killed chickens for Eid. Public ul’hiya events were introduced by Islamic NGOs in 2010. Aside from music concerts, traditional dances and sports competitions, older Eid customs include Maali Hingun, a parade with participants in masks and costumes, and Bodumas Beynun, where fishermen try to catch a large fish woven with palm fronds. Most activities in the Greater Malé area were centred in the reclaimed island of Hulhumalé. The Housing Development Corporation – a state-owned company tasked with the urban development of Hulhumalé – organised a children’s evening with an Eid parade and water slides, as the Maldives Airports Company Ltd sponsored a beach party with fitness dances. Other events organised by HDC included fireworks, music shows and graffiti contests. 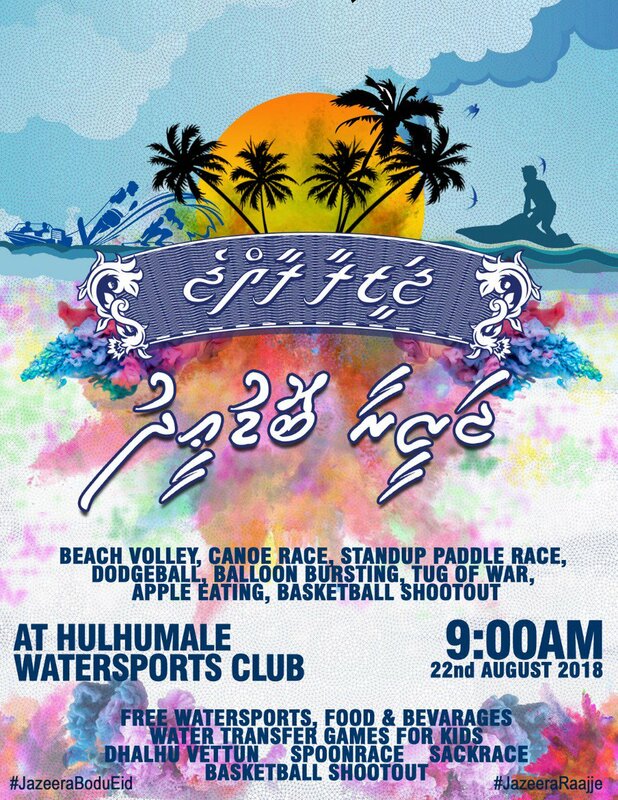 The opposition coalition has also planned a beach sports event in Hulhumalé for Wednesday morning, offering free water sports, food and competitions for children.